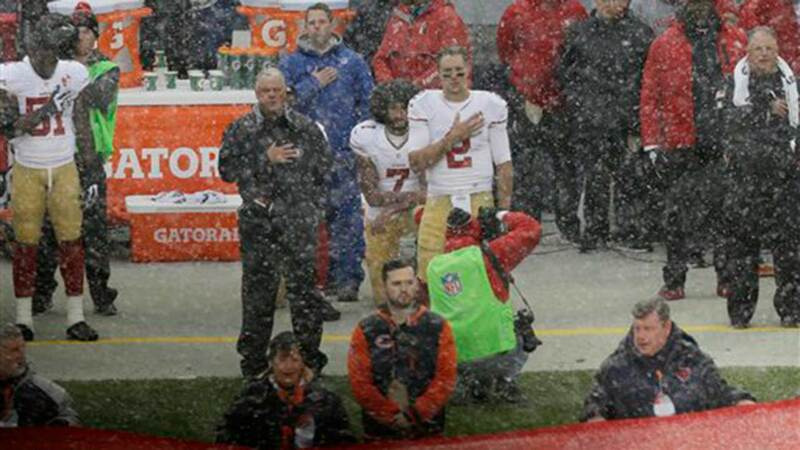 CHICAGO (WLS) -- San Francisco quarterback Colin Kaepernick continued his protest by kneeling during the national anthem at Soldier Field before the 49ers game against the Chicago Bears. Kaepernick has drawn national attention for his decision to kneel during the national anthem before games in order to bring attention to what he says is the mistreatment of people of color. On Saturday, veterans, police officers and others rallied outside Soldier Field urging Kaepernick to stand for the national anthem. They said since Soldier Field is named in honor of soldiers, he should stand. Prior to the national anthem, Kaepernick signed autographs and took pictures with fans.